We love 99.9% of things about country living. In fact, neither Cowboy nor I want to trade in the work, peace, or beauty of the country to go back to the ‘burbs. However, if there is one thing that can make me shriek and consider condo living, it is the S word. That’s right, S-N-A-K-E. Those squirmy, sneaky, legless slitherers are NOT my friends. We’ve been pretty blessed at the farm. We’ve found just two snakes in five years, and one we only found after we ran over it with the tractor. Bonus! But with this year’s spring rains they seem to have discovered the farm, and we found three on the porch in 36 hours. Let me correct that, I found three. Snake number one slithered onto the porch just as I was about to let the pups out. Unfortunately, Cowboy wasn’t home at the time and couldn’t get here immediately. (Of course!) Panic mode fully in place, because I was not going to go toe-to-toe or rather toe-to-slither with a snake, I picked up the phone and called my dad. Dads fix everything, right? We hung up and I stayed glued to the window making sure I knew exactly where that snake was. I couldn’t risk a get-away, or I may never step foot on the porch again. Five minutes later, my mom called me back. Not so happy to be comic relief, I breathed a sigh of relief as the calvary was on its way. I grabbed my pink rubber boots and stood at the ready. What an utter goofball I looked like. You’d think I was going to do battle with the garden rather than snakes. Whatever works, right? And then I saw Dad round the driveway, that lovely Dodge truck was a white horse. Dad saved the day, and by day I mean my sanity. Sorry Mr. Snake. You are not welcome on the porch! Dad saved the day, and was an excellent shot. Dad did feel bad, as he said it was a “good” snake, i.e. not poisonous. However, while my brain knows this, my nervous system does not. In fact, that night I dreamed about being chased by snakes. Let’s just say, I’m not a fan. Snake number two and three came when Cowboy was around. (Lucky, Cowboy!) Snake number two still came with an assist from Dad, as he was stuck up in the porch roof rafters, and unfortunately ate a nest of baby black birds. Sad about the birds, and this also came with a new realization that I had to look not only down but up for snakes. Holy cats, are you kidding me? Snake number three showed up on our side porch wrapping itself around a door handle. For the love of pete I hope this stops. By snake number three, Cowboy has this routine down, sadly. Routine starts with a call of, “Cowboy! Snake! Now!” To which I hear him laughing and boots come stomping. Shovels collected. Snake in sight. Snake dead. The big lesson? Screened in porch just moved up the priority list of projects. Hardware store here we come! Serioulsy snake number three? Nothing like seeing a snake stick it’s head on a door and stick out its tongue to make a girl scream. Enough already! God bless Cowboy. He set to mowing some of the tall grasses around the barn within an hour of snake number three. I love that man so! P.S. 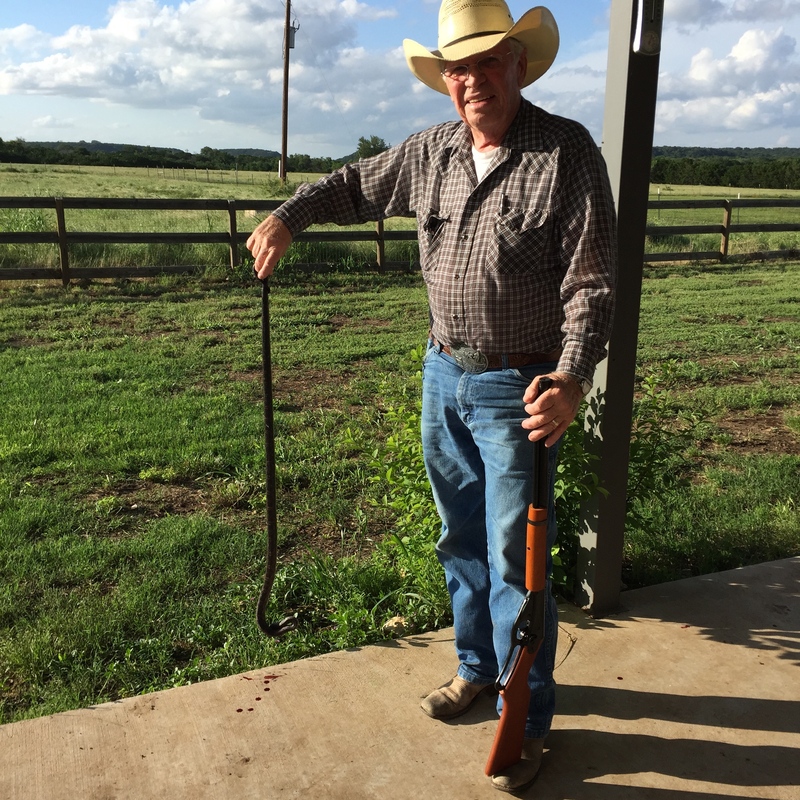 – Yes, snakes were harmed in the making of this blog. We’re sorry. They simply FREAK us, i.e. me, out. I know it’s not the right thing to do, but I’d like to keep breathing at a normal pace. All were a minimum of four feet. This farmgirl is just over five feet. You do the math. P.P.S. – Ironically, snake number three came in the middle of writing this blog. Guess he needed to make an appearance. P.P.P.S. – I refuse to categorize this as a critter story. Critters require legs. So you’ll find this under farm life. Just saying. I am right there with you on this one!